What can you expect in Germany? 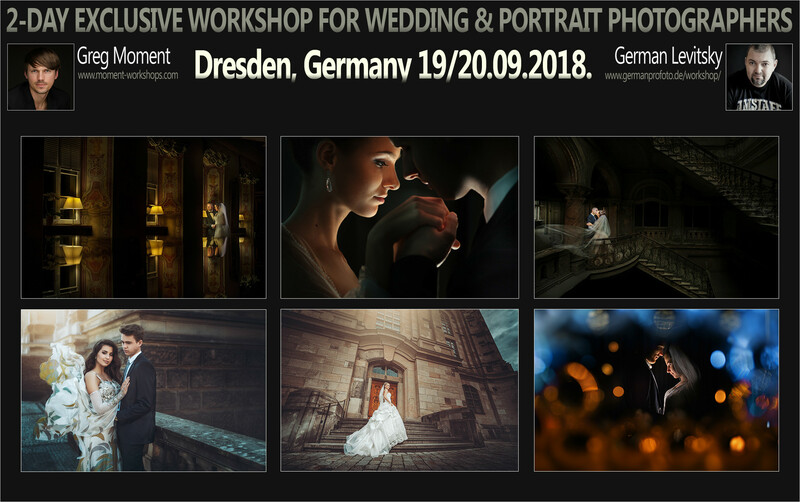 This time Greg Moment (www.moment.com.pl) provides two-day-long workshops for wedding photographers in Dresden, Germany together with great German Levitsky (www.germanprofoto.de) – a professional photographer, filmaker and coach. Member of Fearless Photographers and Best of Wedding Photography (premier invitation-only association for the World’s Top wedding photographers). Do not skip this opportunity and learn from German Levitsky and Greg Moment! ► You will see how German Levitsky and Greg Moment create vision and style in Photoshop at the end. Language: English (with the support of translator: English <> German). Regular fee: 500 EUR. Group 15-20 photographers. 200 EUR deposit is required to reserve a seat. Way of payment: Paypal: info@germanprofoto.de or a regular bank transfer within Germany. If you have any problems with Paypal – contact us to find the most convenient way of payment for you. Remaining fee is paid in cash when the workshop begins.